As an archival researcher at Yad Vashem, I respond to requests for information on the Holocaust victims from Poland. The rich archival resources available in Yad Vashem’s notwithstanding, it is not always possible to trace the fates of Jews here. I often strive to uncover previously unknown fragments of personal lives of the Holocaust victims and survivors from different archives, through such clues as a photograph, a date and place of birth, an address or names of family members. In the framework of the EHRI fellowship, I spent two weeks in the Jewish Historical Institute (Żydowski Instytut Historyczny, ŻIH) in Warsaw, researching Holocaust-related materials. I wanted to find out what documents from the ŻIH archives could be used in combination with Yad Vashem’s documents in order to reconstruct live stories of specific people. In particular, I hoped to locate documents containing personal information about victims of the Holocaust in order to provide richer account of their lives and fates during the Holocaust. Sometimes the survivors themselves did not tell their stories to their children, and the second generation did not ask questions. Often, there is almost nobody to ask anymore. Still, the descendants often wish to see the place of their grandparents’ residence and gather surviving fragments of family’s past. They come to archives, apply to get assistance of an archival researcher and we start to collect the puzzle. Not only is this search fascinating, it often gives great results. Sometimes, I manage to trace the only surviving photo of a person killed 70 year ago or locate living relatives and family members who thought they were all alone. In many cases, the names of Polish Jews who perished during the Holocaust are recorded in Yad Vashem only on Pages of Testimony; those forms are considered virtual memorials for people who were murdered during the Holocaust (most do not have physical monuments commemorating them). 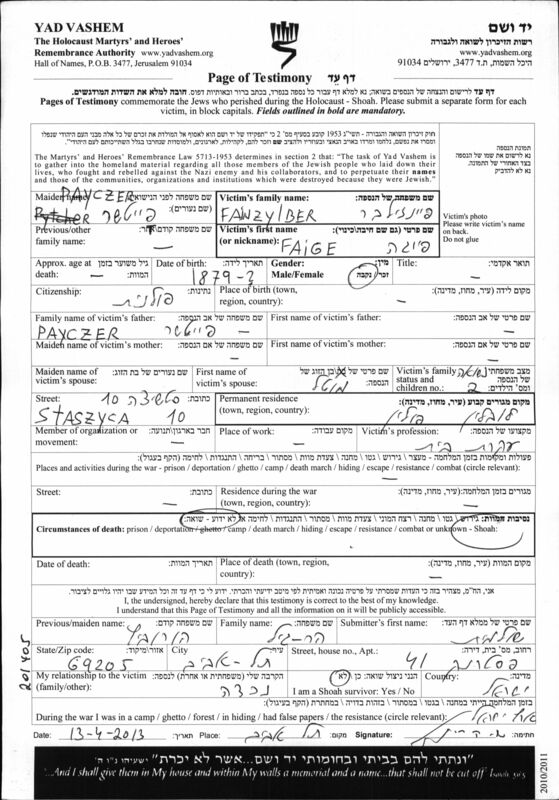 For example, the Page of Testimony regarding Faige Fainzylber from Lublin was filled out by her granddaughter living in Israel. The granddaughter did not know the exact date of birth of Faige Fainzylber, nor how her grandmother spelled her name in Polish. Likely, she never saw any of Faige’s photos as well. Combining the resources of Yad Vashem with documents in Polish archives can offer, however, a much richer account of Holocaust victims. 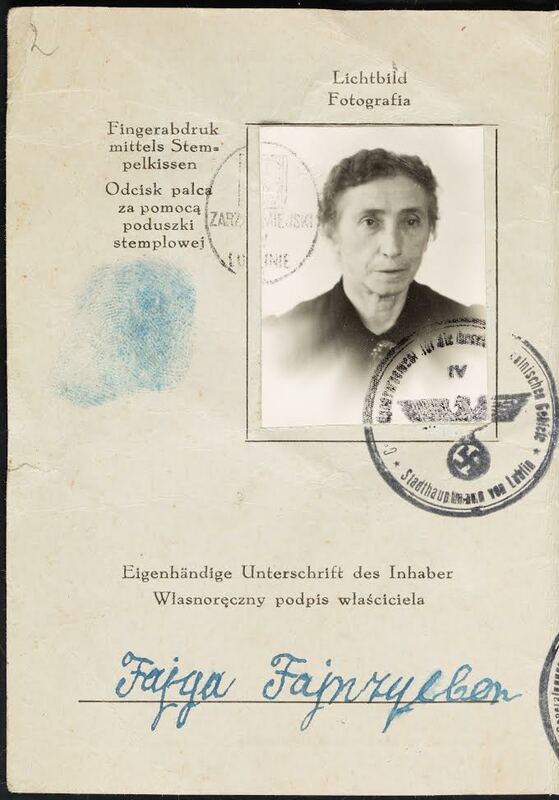 The ŻIH’s collection of the Rada Żydowska in Lublin (Jewish Council in Lublin) contains the Personalausweis (ID card) of Fajga Fajnzylber, née Pajczer with her signature, photo, fingerprint and personal information. Fajga signed the document in 1940. As it turns out, the synergy of documents from different sources is extraordinarily important. Only by considering Fajga’s Page of Testimony and the Personalausweis together, can we create a fuller picture of Fajga’s fate. Details provided by the submitters on the Pages of Testimony not only offer an opportunity to reconstruct the family story, but sometimes also to find members of the family. Continuing the search in Lublin State Archives (Archiwum Państwowe w Lublinie), Fajga’s birth certificate (from 1877) and marriage certificate make it possible to reconstruct her parents and husband’s names. I also unsuccessfully tried to search for further information in the database of International Tracing Service. Jews from Lublin were mainly deported to Majdanek concentration camp. Unfortunately, there are almost no surviving records from Majdanek. Therefore, I can only assume that Fajga Fajnzylber was sent to Majdanek and she was murdered there. Most likely, the documents from the three archives and memory institutions do not cover all historical evidence on the life and fate of Fajga Fajnzylber. This case illustrates the significance of connecting sources across national and institutional boundaries and creating tools, such as the EHRI portal, that allow us to search in multiple archives. Thus, perhaps, in the future even richer information about Fajga would emerge.